Now you can encounter ISZMA, my new hero - at least on the cover. Dancing, holding poisonous blades in her hands. 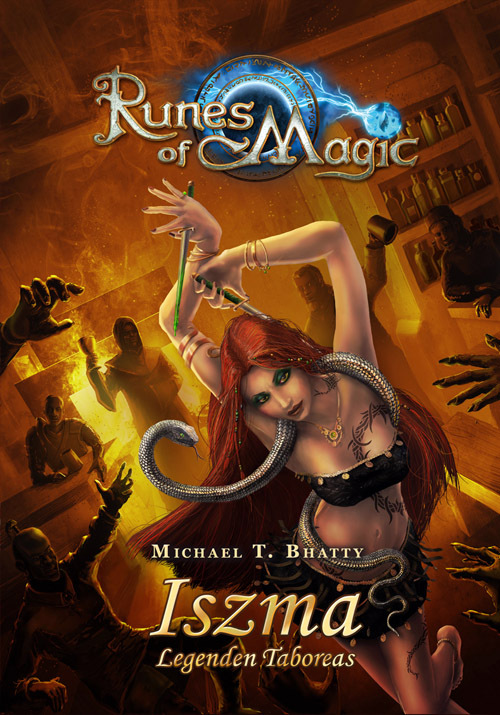 This time my novel's hero is a dancer herself (well, besides being an assassin and a thief): ISZMA, the final book of my RUNES OF MAGIC-novel series is about to be launched! I often, nay, always have dancers in my stories and artworks. Dancing maidens, witches and elves are there to be found as well as tavern dancer's in my Science fiction stories. Check it out, there are always bars and taverns. In Beryl Tales there were spaceports with dancers, in SACRED there have been quests and even in my next story - hopefully coming with the year - dancers play their part. So why do I use this subject? The answer isn't an easy one, because there are many reasons for it. One reason might be, that I have always had contact to dancing and thus to the performers, be them oriental belly dancers, tribal dancers on mediaval markets or the classical and convential dancing on parties. Well, what can I say. I like dancing as a form of art. It is a powerful form of expressing... 'energy '. It is raw and wild, powerful and gentle, precise or chaotic. so many patterns one can dive in. Expressing personality is something I enjoy when taking to singers, dancers and actresses. It might be a form of resonance, but as an artist myself I often find contact with the bands playing somewhere or having a nice chat backstage from time to time. ISZMA is my hommage to those performing ladies, who are true artists in their hearts.